Messier 40 (M40), also known as Winnecke 4 (WNC 4), is a double star located in the constellation Ursa Major, the Great Bear. M40 lies at a distance of 510 light years from Earth. It is one of the few Messier objects that are not deep sky objects, but were catalogued by mistake. It was not listed in the New General Catalogue (NGC). Messier 40 is easy to find as it lies right next to Megrez, one of the bright stars that form the Big Dipper asterism in Ursa Major. Megrez is the star that connects the handle of the Big Dipper to the cup, or the star at the base of the Great Bear‘s tail. 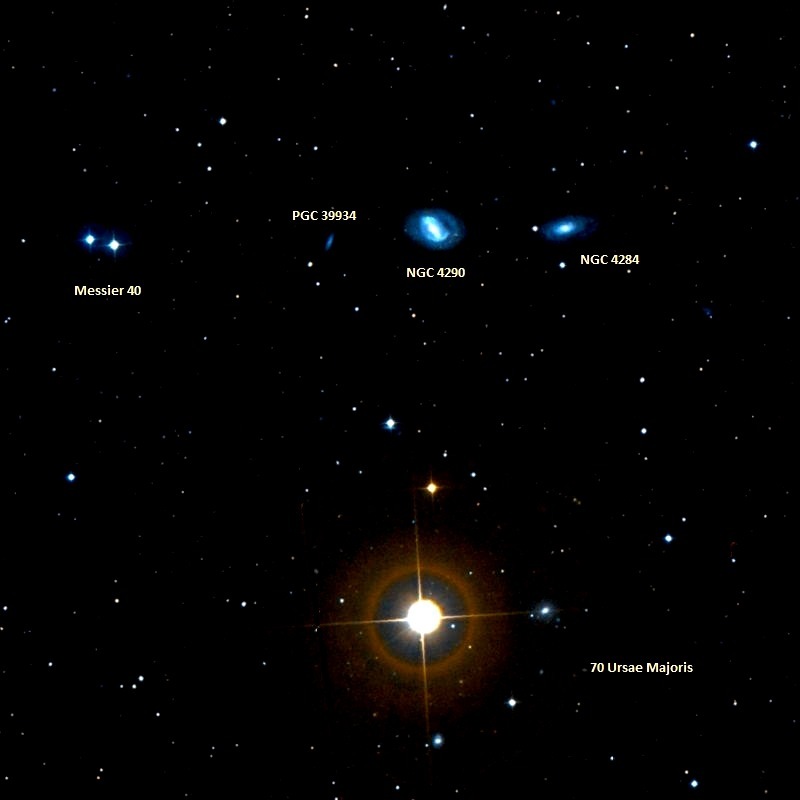 M40 is located about 1.5 degrees northeast of Megrez and 17 arc minutes northeast of 70 Ursae Majoris, an orange giant star with a visual magnitude of 5.54. Winnecke 4 can be seen in 10×50 binoculars, but is better viewed in 20×80 binoculars or small telescopes. Small and medium-sized telescopes will show a pair of stars, one orange-yellow and the other white in colour. Messier 40 is composed of a G0-type star and an F8-type star with apparent magnitudes of 9.65 and 10.10. The stars are separated by 52.8 arc seconds and form an optical pair, lying along the same line of sight, but not physically connected to each other as they are known to be at different distances from Earth. The brighter component (G0) is designated as HD 238107 and the fainter (F8), HD 238108. The more distant component lies more than 1,900 light years away. Winnecke 4 was discovered by Charles Messier on October 24, 1764. Messier was looking for a nebula reported in the area by the Polish astronomer Johannes Hevelius in the 17th century, but did not find one, so he catalogued the double star instead. The “nebula” reported by Hevelius may have been the 12th magnitude barred spiral/early type ring galaxy NGC 4290, which may have been visible in large telescopes at the time, but not in those Messier used. The same night on October 24-25, , I searched for the nebula above the tail of the Great Bear, which is indicated in the book Figure of the Stars, second edition: it should have, in 1660, the right ascension 183d 32′ 41″, & the northern declination 60d 20′ 33″. I have found, by means of this position, two stars very near to each other & of equal brightness, about the 9th magnitude, placed at the beginning of the tail of Ursa Major: one has difficulty to distinguish them with an ordinary (nonachromatic) refractor of 6 feet [FL]. Here are their positions: right ascension, 182 deg 45′ 30″, & 59 deg 23′ 50″ northern declination. There is reason to presume that Hevelius mistook these two stars for a nebula. If Messier had had a larger telescope, he would have discovered not one, but at least two galaxies in the vicinity of the double star. NGC 4284, another spiral galaxy, can be found right next to NGC 4290, and PGC 39934, a 17th magnitude galaxy, can be seen between NGC 4290 and M40. 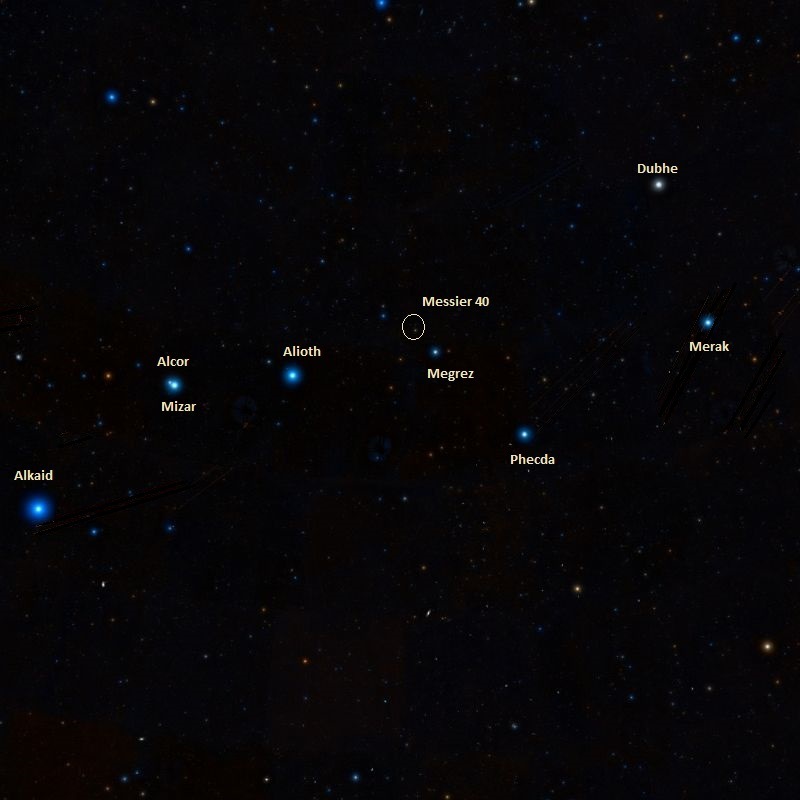 Messier 40 is one of three curiosities included in Messier’s catalogue that are not deep sky objects. The other two are Messier 24, the Sagittarius Star Cloud, which is a Milky Way star cloud, and Messier 73, an asterism formed by four stars, located in the constellation Aquarius. Messier 40 was later discovered by the German astronomer Friedrich August Theodor Winnecke in 1863. 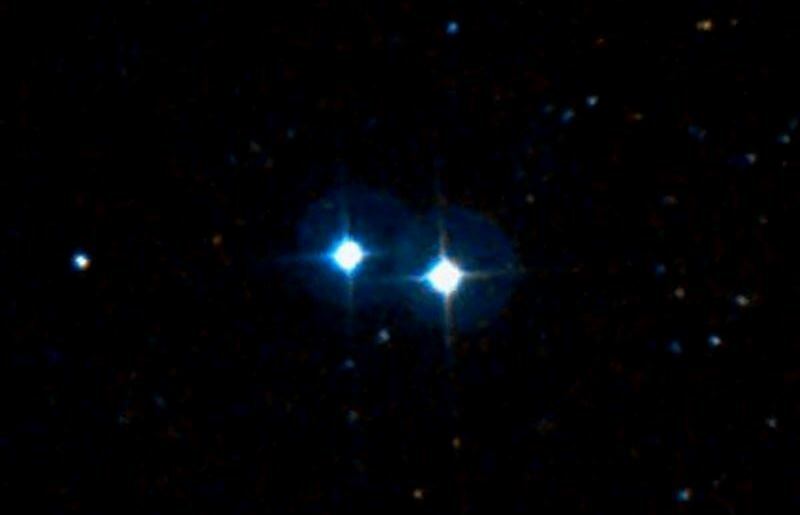 Winnecke included it in the Winnecke Catalogue of Double Stars as the fourth entry, WNC 4. When Winnecke discovered the double star, the angular separation between the two components was measured as 49.2 arc seconds. John Mallas, an American amateur astronomer, was able to identify Winnecke 4 as Messier’s 40th catalogue entry around 1965. In 1966, the separation between the stars was determined as 51.7 arc seconds. By 1991, it increased to 52.8 arc seconds.